TD_Audio celebrates the new summer of love with this inspiring selection of sonic goodies geared for the next big room anthem. Tropical House channels the Style of Summer from the shores of Ibiza straight to your Daw. Each year, the world’s best house DJs rally in Ibiza to bounce fresh tracks along the beach. Here you’ll find the rolling Bass, ecstatic Leads and driving Drum Loops of the Deep House style on summer break—get tropical with mellow Horns and upbeat Percussion, Drops and Chord Stabs, smooth Vocal Loops and wild FX, Noise and Mechanical Sounds. This versatile production pack is perfect for producers looking to explore new sounds in House, Deep House and Tropical House. It’s well stocked with all the tools you need to rock out a track or spice up a remix: 100 WAV Samples, 10 Spire Presets and 20 MIDI files to bring your sounds to life. 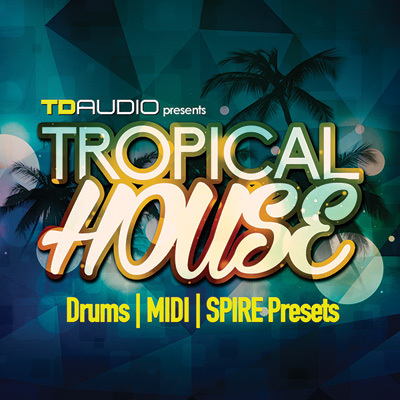 Tropical House is presented by TD_Audio, the powerhouse team of Twisted Reaction (Function Loops) and Lenny Dee (Industrial Strength), two tenacious names in modern sound design. Combining cutting-edge gear with meticulous engineering and production, TD_Audio creates upfront production packs and kits at the frontline of dance music. The Summer House style is rolling ashore—get ready to stir some sine waves into your next musical cocktail.